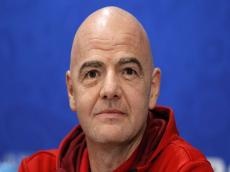 FIFA President Gianni Infantino is a sole registered candidate for the presidential election of the world’s governing football body this summer, FIFA said in a statement on Wednesday. "Following the call for election issued by the FIFA Council on 10 June 2018, FIFA’s member associations have proposed, in due time and form, the following candidate for the presidential election to take place at the 69th FIFA Congress in Paris on 5 June 2019: Gianni Infantino," the statement says. "The Governance Committee will monitor the electoral process, ensuring the correct application of the FIFA Statutes and regulations," FIFA added in its statement.